This week New Leaf Community Market in Boulder Creek held a Community Day for the Museum. 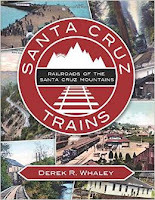 The Museum stationed a table with literature about the Museum and a few examples of local history books from the Museum store, including Santa Cruz Trains by Derek Whaley. A visitor to the table, a railroad enthusiast, gave the volunteers this yellow object, which they passed on to me. I must admit I first thought it was a child's toy. A plastic, replica tool with which a three year old might play. But the markings gave it away - no not a toy, but a tool. This is a Millerfelpax locomotive reverser handle. It is made of Versylon, which is according to Miller Felpax an "Impact-Modified 6/6 nylon." It is strong, hard, and dense and so lends itself to tough environments such as railroad use. The reverser is a tool that determines the locomotive's direction. It has three positions - forward, reverse, and neutral. If it is in the forward position and the throttle is opened the locomotive will move forward, if it is in the reverse position it will move backward. These tools are used on steam locomotives and diesel locomotives. Older tools were made of metal, such as bronze. It is a standard size as the tools are required to fit all locomotives regardless of the manufacturer. It is removable - a safety feature. Removed whenever the locomotive is not in operation.